irelandphoto.com >> local history >> The Cross That Was Too Much to Bear. The Cross That Was Too Much to Bear. St. Colm Cille, or Columba as he is known on Caledonian shores, was the first to take Christian teaching to Scotland from Donegal, founding the abbey of Iona there. He would walk from his birthplace and first monastery at Church Hill by Loch Gartan over the mountain pass at Muckish and down to the sea and shore, often joined by the somewhat gruff and dour St. Finian. So when a huge celtic cross, similar to the one on Iona, was hewn out of the solid rock of Muckish destined for Tory Island, the two of them accompanied it on its journey down the mountain, supervising its progress. It became the custom to build these crosses in two parts and then re-assemble them, as it was common for them to break due to the extra weight of the celtic design. At this time, though, there weren’t any masons by trade, and the assorted band of monks and locals who teamed up for the construction never had a good track record with the old-style one-piece sort, like this one. Slowly then, the giant cross made its way down the mountain. In order to get rid of the irritating St. Finian, Colm Cille asked him to return to where they had been working and fetch a manuscript he had left behind. Have you ever started carrying something only to find that it gets strangely heavier with time? Well, the cross reached Raymuntardinney, and with one man down and a long way to go still, it was agreed that it was far too heavy for the sea crossing to Tory. The cross was laid down on the grass next to the church, and never went any further. Today, the ruin of a newer church stands on the same site, and the cross is still there for all to see. It is said that every summer you can still see its impression on the new-grown grass beside the church. Centuries after St. Colm Cille, the mountain pass at Muckish was to witness an altogether heavier human traffic, as local people left Donegal in their droves at the start of the Famine. 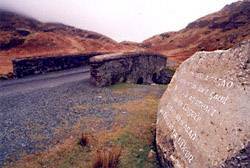 The bridge at the very top became known as the Crying Bridge, as it was there that families said farewell to their loved ones in “an scaradh bronach” (pronounced un skara bronaak), or a sad parting.